Buy works – Romodanovskaya Antonina Alexeyevna | (1906, Moscow – 1985, Moscow). Romodanovskaya Antonina Alexeyevna (1906, Moscow – 1985, Moscow). Romodanovskaya studied at the Higher Art and Technical Workshops, later Institute (VHUTEMAS-VHUTEIN) (1930); V. Favorsky and N. Kupreyanov were her teachers. 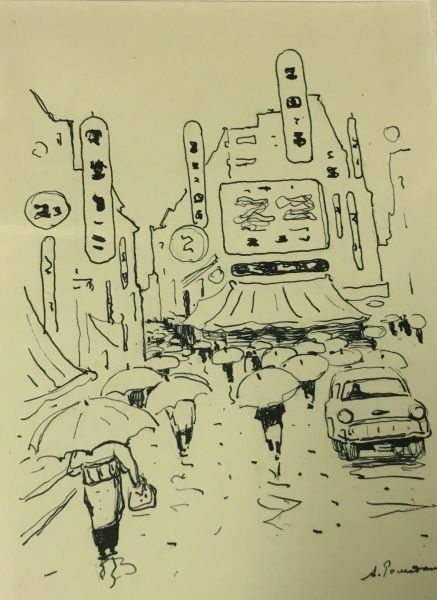 Initially she worked in the field of xylography (1928-1930), but from mid-thirties on she wholly concentrated on easel drawing and watercolor painting. During her trips to Altai, Middle Asia, down the Volga and to Trans-Baikal she made landscape sketches and watercolor pictures. Later on, cityscape became the chief domain of her work. 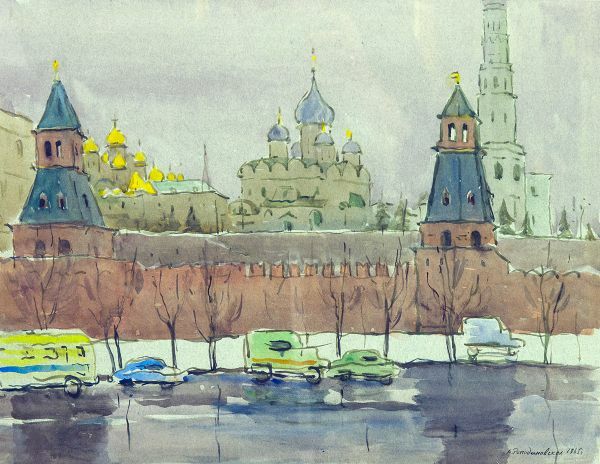 In 1947, Romodanovskaya produced a cityscape series Around the Kremlin’s Ancient Walls dedicated to the 800th anniversary of Moscow. 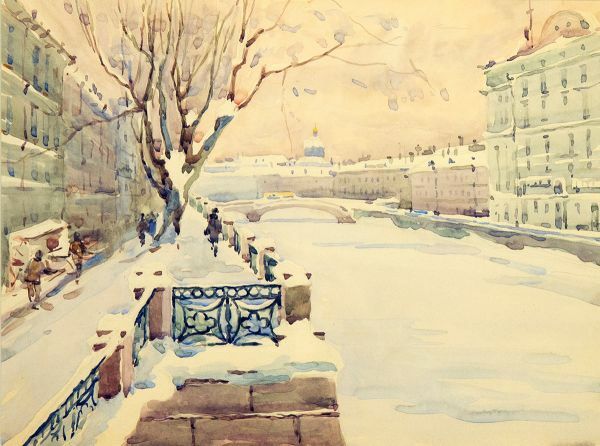 A series of watercolors was a result of her trip to Leningrad in 1952. She depicted landmarks of Kiev, Novgorod, Pskov, Odessa, Moscow region and the area in Ryazan region where the poet Sergei Yesenin lived. In the late 1950s and 60s, she designed postcards and envelopes; reproductions of her works were published in periodicals such as Ogonyok, Smena, Inostrannaya literatura, Sovetskaya zhenschina, Vechernyaya Moskva. The artist’s works are in the State Tretyakov Gallery, in the Pushkin State Museum of Fine Arts, in the Museum of Moscow city history, in fine art museums of Bashkiria, Yakutia, Yekaterinburg, Samara, and Cheboksary. Technique – Watercolour on paper. Technique – Watercolor on paper. Bell Tower of the Novodevichiy Monastery. 25000 - 35000 rub. 25000 - 35000 rub. 29000 - 30000 rub. 29000 - 30000 rub. 30000 - 32000 rub. 30000 - 32000 rub. 30000 - 45000 rub. 30000 - 45000 rub. 30000 - 50000 rub. 30000 - 50000 rub. Odessa. The Theatre of the opera and ballet. 40000 - 50000 rub. 40000 - 50000 rub. 30000 - 35000 rub. 30000 - 35000 rub. 35000 - 50000 rub. 35000 - 50000 rub. 60000 - 80000 rub. 60000 - 80000 rub. 60000 - 90000 rub. 60000 - 90000 rub. 2000 - 2000 rub. 2000 - 2000 rub.